Hi guys, I’m guest blogging today for Flora to share some tips on how to create a space to do your art, even if you have a small space. In my new book, Your Creative Work Space, I interviewed Flora to learn how she’s created her own sweet spot work space, plus I’ll share some more sage advice from other creatives that were featured in the book. Today Flora has a big gorgeous studio, but that wasn’t always the case. Don’t let not having a proper studio stop you from your creative work. Photo by Zipporah Photography. Don’t let the size of the space stop you. If you have a wall and a table, you can create a studio. Not everyone has the funds to rent the perfect studio space, but most people have access to a wall! Artist Catalina Rodriquez uses part of her living room as her art studio. “I have a big white desk in the living room and work there or on the floor…. I use the wall behind my table as an inspirational mood board that I change constantly.” Photo by Yolanda Ataraxia. Keep your supplies handy. What’s out of sight is often out of use, so even if you have a small space, it’s best to have easy access to your supplies. Graphic Designer and Illustrator Johanna Stark also created a studio in her living space. “My boyfriend and I created the work table with just some wood we sawed and painted and some inexpensive table legs from IKEA.” Johanna added filing cabinets underneath the table to store supplies that she doesn’t use as often such as tape, string, glue, hard wire, etc. but keeps many of her paints, colored pens and paper out. Photo by Johanna Stark. No space to speak of? Use nature as your inspiration. Nothing inspires more than hitting the road to discover a new place. For Gypsetter and creative Robyn McClendon, this just means packing up her easel. Robyn McClendon loves to travel and create, so she takes her supplies wherever she goes. No studio needed. Her advice,” Just begin doing what makes you happy. Don’t compare yourself to others. Instead, channel that desire into inspiration so you can create your own perfect place…” Photo by Shen Daughtry. 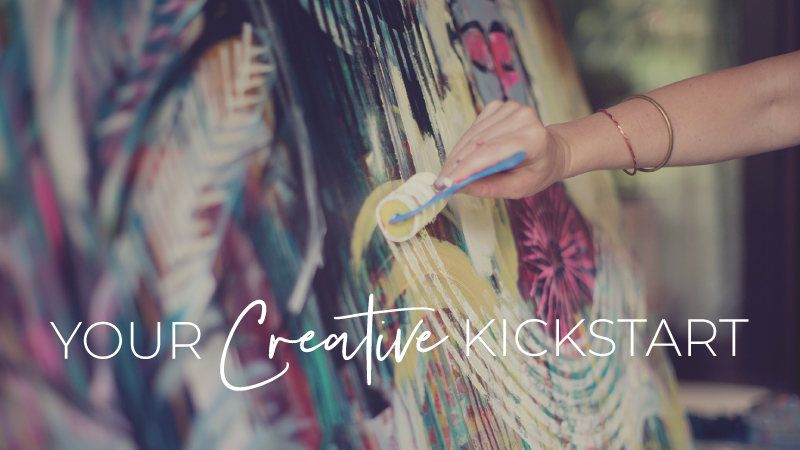 Louise Gale picked the room with the best view for her creative work space on the Costa del Sol (Spain) where she paints, writes, and creates digital products. Photo by Louise Gale. Convert any space into an art space. Artist Amy Kavelaris, or Amy Kavs, is a woman on the move, literally. She moves so much I can barely keep up with her, but one thing remains a constant- wherever she lands, she makes space for her art. You can do the same. Artist Amy Kavs sets her easel in the dining room, in the playroom, or out by the lake… she is not limited by her environment or the fact that she’s a mother. She simply sets up shop wherever she is and gets to work. Photo by Nick Kavelaris. *All photos are featured in Desha’s book, Your Creative Work Space. International Retreat Leader, LifeSTYLE Design Coach, and Founder of Sweet Spot Style, Desha Peacock is the author of Create the Style You Crave and Your Creative Work Space. Find her at www.sweetspotstyle.com or on IG @deshapeacock.